The West Crater Rim is a solid step-up in difficulty from the standard south side climb up the Old Chute or Pearly Gates. It begins to diverge from the standard route around 9,000 feet, where climbers head West to the other side of Crater Rock. In early season, 2-4 pitches of steep snow leads to a bench at just over 1o,000 feet in the upper crater. 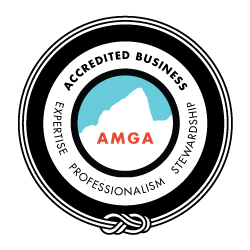 From here, your team will traverse toward the summit rim, until it’s time to anchor off and climb more pitches of steep snow. It can steepen to nearly 50° here, as several pitches lead to the rim. 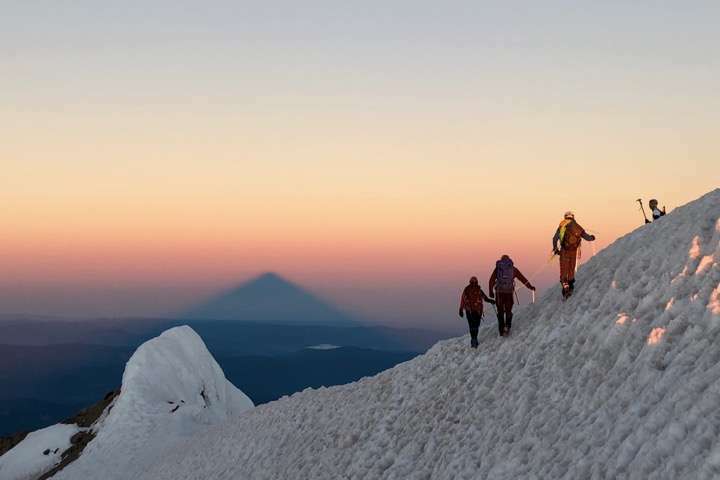 A vertiginous walk along the summit ridge leads to the apex of Oregon. We’ll descend via the south side route, mingling with the dozens of climbers on the summit. The West Crater Rim is a great step up from the Old Chute. It has steeper snow and more pitches of climbing, as well as a mandatory walk along the summit ridge which catches every climbers attention. Climbers who have been on the South Side of Hood and are looking for a one-day climb to push their limits will love this route and the access from the Timberline Lodge. The Devil’s Kitchen Headwall adds alpine ice and rime-ice climbing to your resume, complementing your time on steep snow. Climbers should have a prior steep snow climb under their belts, like the South Side of Mount Hood, or a Winter/Spring climb of Broken Top.